The Sukhoi Su-17 (NATO reporting name: Fitter) is a Soviet variable-sweep wing fighter-bomber developed from the Sukhoi Su-7. It enjoyed a long career in Soviet, later Russian, service and was widely exported to Eastern Bloc, Arab air forces, Angola and Peru as the Su-20 and Su-22. It is the first variable-sweep wing of Russian/Soviet origin. The Su-17 set a number of world records. Based on the revised airframe of the Su-17UM, but with an avionics bay and an additional fuel tank in place of the rear cockpit, increasing the internal fuel capacity to 4850 l (1,280 U.S. gal). Doppler radar moved internally, removing the fairing. "Klen-P" laser rangefinder/target designator. A launch rail for K-13 (AA-2 "Atoll") or R-60 (AA-8 "Aphid") was added between the two existing pylons on each wing. First flight: 30 June 1976 with V. A. Krechetov at the controls. 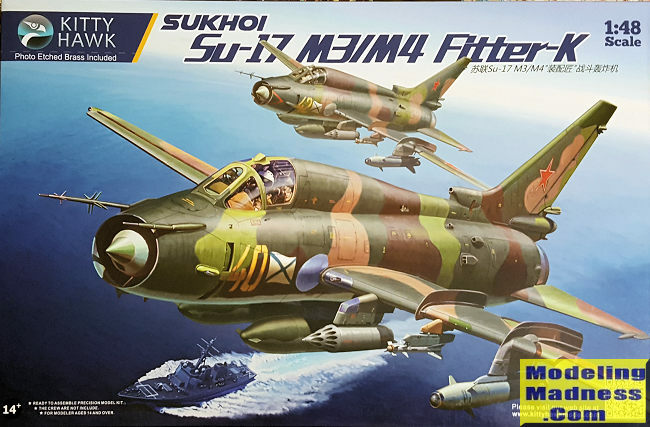 Export version with the R-29 engine and downgraded avionics (equivalent to Su-17M2) was designated Su-22M (factory designation S-52K, NATO "Fitter-J") and first flew on 24 May 1977 with E. S. Soloviev at the controls. An export version with Su-17M3 avionics was designated Su-22M3 (factory S-52MK). Su-17 manufactured 1976–1981, Su-22Ms were manufactured 1978–1984. Su-17M/Su-22M/Su-22M3 was the most numerous variant with almost 1,000 built. Final production version with considerably upgraded avionics, including RSDN navigation (similar to LORAN), beacon navigation, inertial navigation, a more powerful (Klyon) "Kлён-54" laser rangefinder, radio compass, and SPO-15LE ("Sirena") radar-warning system. Additional fuselage inlets (including ram-air inlet at the base of the fin) to improve engine cooling airflow, fixed air intake shock cone. Many aircraft were equipped for the use of TV-guided missiles and BA-58 Vjuga pod for anti-radiation missiles. AL-21F-3 engine. Export version was designated Su-22M4 (factory S-54K). First flight: 19 June 1980 with Yu. A. Yegorov at the controls. Su-17M4 was manufactured 1981–1988, Su-22M4 was manufactured 1983–1990. 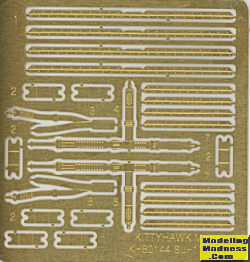 Kitty Hawk has been producing quite a few kits that modelers have really been wanting. 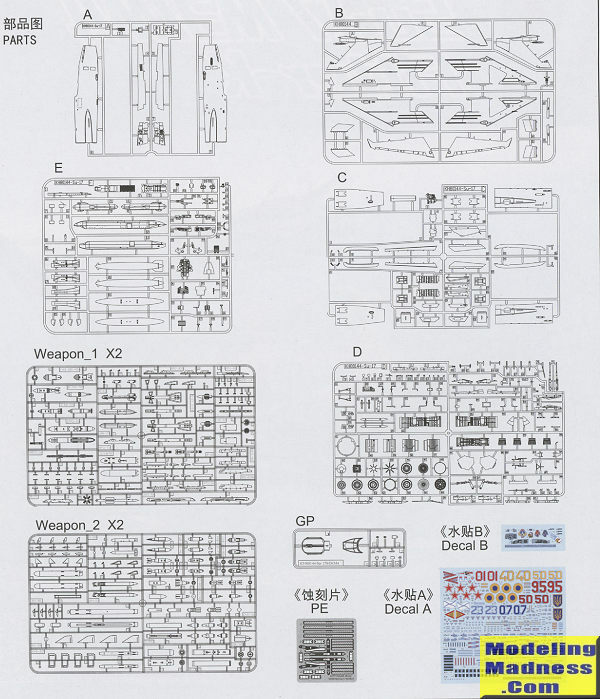 They concentrate in 1/48 and 1/32 scale for their offerings and I know there are folks who would love to see some of these in 1/72, but its current marketing is working very well for them. This most recent release is the most modern of the Su-17/20/22 family concentrating on the M3 and the M4 variants. The biggest visual difference is the intake at the base of the fin for the M4 version. Externally, it is very difficult to tell the difference between the Su-17 and the Su-22 versions of this aircraft so that means that if you want to use Warsaw Pact aftermarket markings, then by all means do so. Kitty Hawk likes to provide the builder with a lot of detail and so there are features you will not find on most other kits. For one thing, you get a full engine, complete with accessory section. In fact, if one wants,they could probably build the kit undergoing maintenance with the rear fuselage section removed. A nicely done cockpit is included and it is here that some of the photo etch is used for a seat harness. The cockpit side consoles and instrument panel are nicely detailed and Kitty Hawk provides decals as well. Other uses for the photo etch fret is for detailing on the fuselage mounted chaff/flare dispensers and as brackets for attaching weapons mounts to the pylons. As you have guessed, the fuselage is in forward and rear sections. This will be quite useful for Kitty Hawk when doing the two seater. Upper fuselage fairings are also separate. This allows one to use the forward fin insert of choice. Russian Tumansky powered jets are known for lots of scoops in the rear and so it is with this one. The four speed brakes can also be posed open if one wishes. Since this is a swing wing aircraft, one builds up the inner and outer wing sections separately. There is no mechanism so it is your choice how it will be modeled. The outer wing includes separate flaps and slats while the inner section contains the main landing gear. The gear wells are built up of separate inner walls. If you have built other Kitty Hawk kits, this is pretty much standard fare. You would expect a big, hulking Russian fighter bomber to have a lot of weapons and pylons and here the kit does not disappoint. A wide range bombs, missiles and rockets and rocket pods are included in the kit. There is also a KKR-17 centerline pod which I believe is a recce pod as two of the markings options are for reconnaissance aircraft. 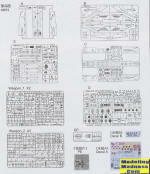 The instructions provide a load-out diagram, though oddly, it doesn't show anything used for the outer pylons. I guess you put on there what is shown on the box art. Instructions are very nicely drawn and provide Gunze paint references. Seven markings options are provided, all in the multi-color camouflage scheme shown on the box art. Note that these were not uniform and that every plane was a bit different. Six of these markings are Soviet/Russian while the seventh is a Ukraine Air Force plane. No specific unit is annotated, but you do get a mix of M3 and M4 options. 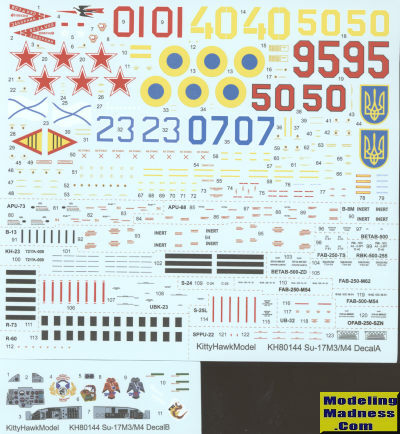 If using the kit decals, which are very nicely done, you'll need to make a choice somewhat early in the build. You also get full weapons decals, and a placement/color guide for them. Those who like their aircraft with red stars will really like this one. The detailing is excellent and while I'm sure it is not a slammer, careful building will result in an outstanding model. I should also mention that while no nose weight was indicated, there is room for it and I'd add some just to be sure.